Mr. Men & Little Miss Glitter Box 18 Book collection and plush Mr Tickle cuddly toy £15 delivered from The book people. 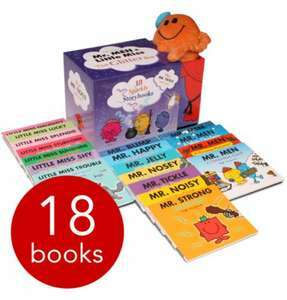 Men & Little Miss Glitter Box 18 Book collection and plush Mr Tickle cuddly toy for £15 delivered from The book people. In the flash sale for £15 (ends tomorrow at midnight) then add the code AFDEL10 for free delivery. Searched and cant find it cheaper anywhere else. Possible 7.07% cashback via topcashback or possible 3% via Quidco. The Mr. Men and Little Miss characters are extremely popular and have been delighting children for generations with their incredible adventures. The likes of Mr. Happy, Mr. Nosey, Little Miss Naughty and Little Miss Sunshine all feature in this amazing 18-book collection which finds them encountering all manner of wizards, dragons, ogres and unicorns. There are even some charming Christmas stories included for an extra festive treat. All the books have glitter on the cover to add some extra sparkle to the stories, and the plush Mr. Tickle cuddly toy is sure to delight any fan. Inspired by his father Roger Hargreaves' iconic creations, the stories and illustrations in this collection are brilliantly written and illustrated by Adam Hargreaves. Just ordered, nice little Christmas present. Thanks op! code not working, but I have still voted hot as it is a good deal. there is a phone number on there and they shall drop books off at your workplace if you ask.